Model 50PD-836 N is a 50 Ohm reactive 2-Way power divider/combiner that operates 400-6000 MHz and is only available with N female coaxial RF connectors. 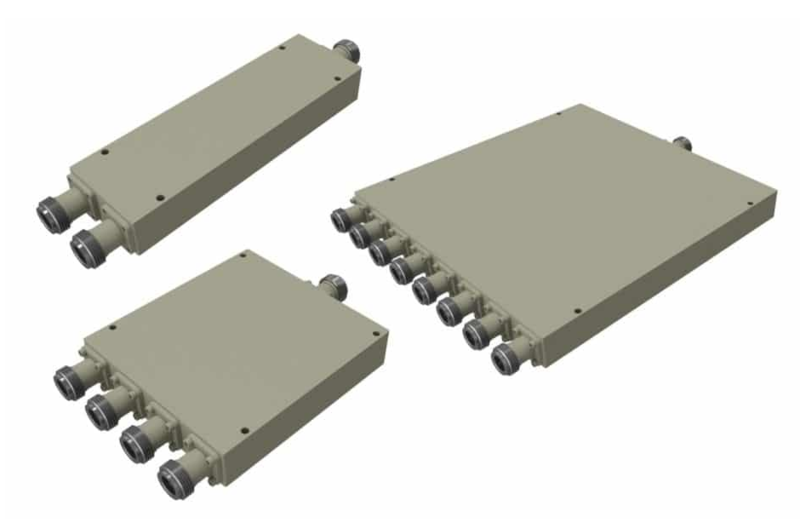 Model 50PD-837 N is a 50 Ohm reactive 4-Way power divider/combiner that operates 400-6000 MHz and is only available with N female coaxial RF connectors. Model 50PD-838 N is a 50 Ohm reactive 8-Way power divider/combiner that operates 400-6000 MHz and is only available with N female coaxial RF connectors. Each of these models have one divider port and two combiner ports. Any signal from divider port to combiner port will have insertion loss (i.e. 3 dB nominal loss). Any RF signal from a combiner port to another combiner port will have isolation (i.e. 18 dB nominal loss). For more information on the individual models, download the available datasheets.